XEOMIN®. A Uniquely Purified Choice for Frown Lines. Find an Xperience Provider on the XEOMIN® Aesthetic doctor locator. Schedule your appointment for your XEOMIN® treatment. After treatment, your Healthcare Provider will give you a Virtual Reward Pin. 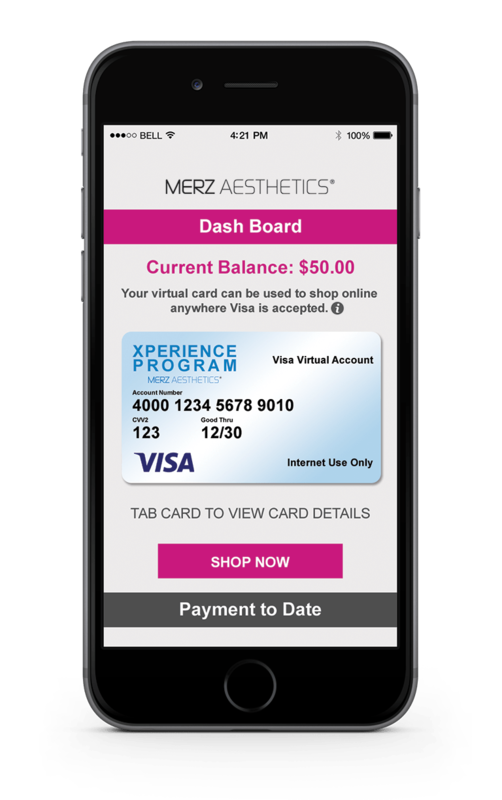 Click “Get Virtual Reward” to register for the Merz Aesthetics Xperience Program or “Sign-in” if you’ve already been part of the Xperience Program. Enter your information and select the XEOMIN® Xperience Program Offer. Enter the Virtual Reward Pin provided to you from your Healthcare Provider after you received your XEOMIN® treatment. Use your loaded virtual prepaid card towards your treatment cost* or anywhere that Visa is accepted online. *Card numbers can be entered manually if used at Healthcare Providers office locations.